This sweet cyborg lights your little one's way for late-night bathroom trips or sips of water. This mini cyborg liked people too much to work on computers and machines. So he got a bright idea: He'd light your little one's way. Who knew a hunk of metal with bolts for ears could be so heartwarming? 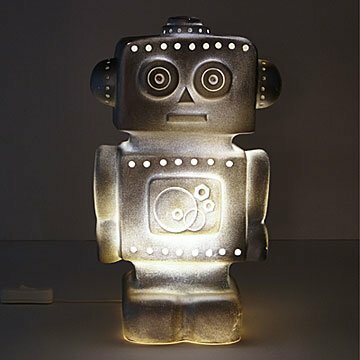 A futuristic addition to a bedside table or desk, the sweet robot emits a warm glow that'll give kiddo some help at night and send them back to a bionic dreamland. Each bot is signed by Belgian designer Gaetane Lannoy. Handmade in Germany.